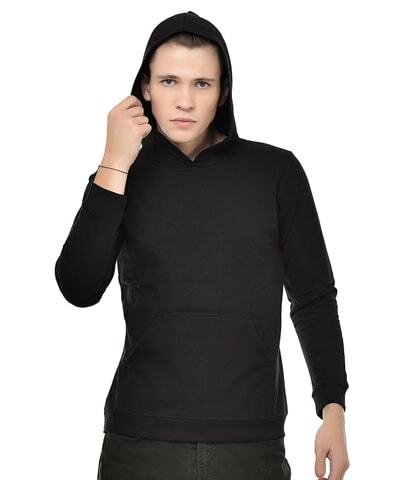 Men's Fleece Hooded T-Shirt Full Sleeve, solid black colour,softest, smoothest, good looking re..
Hoody is a good cloth to wear during winter season to save from cold air. 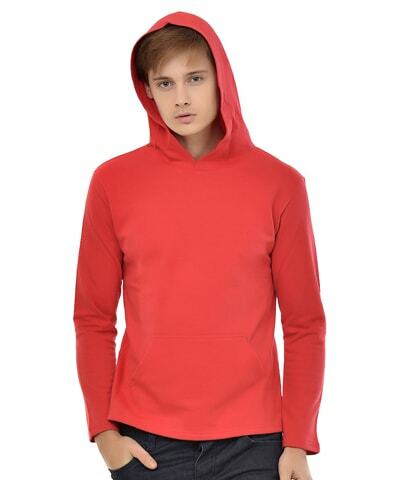 NEEVOV offers different sizes and colours hoodies for men with full sleeve style. Wearing hoodies is a common trend among men, even if they think that wearing these garments is childish or boyish. Men of all ages wear hoodies and only a couple of hoodies in your wardrobe can change your style statement and attitude. In this guide we will discuss the main advantages of wearing Hoodies for men, but before that let us discuss the main features of an ideal hoodie. Before buying it is imperative on your part to size it so that you buy a hoodie which frames your body well. It should be light, thin and warm. There are many hoodies which are bulky because of the designs on them. These designs make them heavy and produced from 60% cotton and 40% polyester. 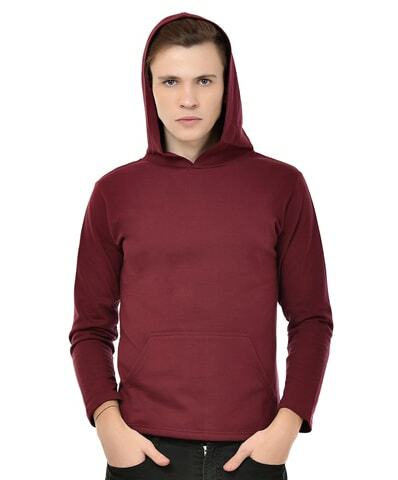 The use of 60% cotton and 40% polyester with 250-270 gsm fabric quality may make many people uncomfortable, but on the other hand, there are many brands which offer great hoodies. These hoodies are famous among youngsters and also known as sweatshirts. NEEVOV branded Hoodies have two pockets and you can keep your mobile, eyeglasses or other things with great amount of ease. Comfort and Easy to wear: Another advantage is that it is soft, light and provides good warmth. You will feel as if you are wrapped in a blanket without actually wearing a blanket. This is a perfect wear for jogging sessions and sports because it takes you on the next level of comfort ability. Modern Stylish: You can pair it with anything to make your own styles statement. A lot of people ask that whether they can wear it with blazers or not? Yes they can wear it with blazers only if it has a great fit. If it is too bulky, then it will blow up your blazer and it will not look good. You can also wear it with a trench coat; it also goes well with any type of jacket. Versatility: If you want to purchase a hoodie which you can wear with almost anything, then go for a hoodie which is not sporty, nor does it look like a sweater. You can wear it with jeans and chinos. Warmth in winter season: A hoodie is a perfect thing to clad in a casual way on different occasions. This is a perfect wear when you are in the city or you are unfurling yourself in a resort. A person who is visiting locations where weather is often changing, taking hoodies is a great idea in this situation. Hooded t-shirts are available with exciting range here at Neevov.com in India. Hooded T-shirts are looking attractive & impressive. There is a huge variety of Hooded t-shirts. Hooded T-shirts are based shopping style and way & standard of your life. Whether you buy once thus, You will be inclined to buy more next time. Hooded t-shirts are appreciated by a large number of people. Hooded t-shirts are in a current trend which is available with a multi-variety brand. Hooded t-shirts have suitable color combination & are loved by all. Hodded t-shirts are perfect for daily life, gym wear, or even casual wear. Hooded t-shirts are available with the fashionable range according to your choice. These are comfortable to wear and large. These Hooded t-shirts will increase your personality outfit. You can get fancy Hooded t-shirt forever so come at Neevov.com and choose your favourite one that seems to you unique clothing brand. This has been made high-quality fabric 60% and 40% polyester it fits for your comfort and fitness. Hooded sweatshirts, alluded to as “hoodie” now hold a changeless place in the form. The hoodie was a bit of dress that began as exercise wear. You can discover hoodies made by renowned dress originators and going in cost as high as the many dollars for a few outlines. Why has the hoodie turned out to be so mainstream? We should investigate who wears them the most. You can include comfortable choices for you Hooded casual wear with fantastic dressing sense. 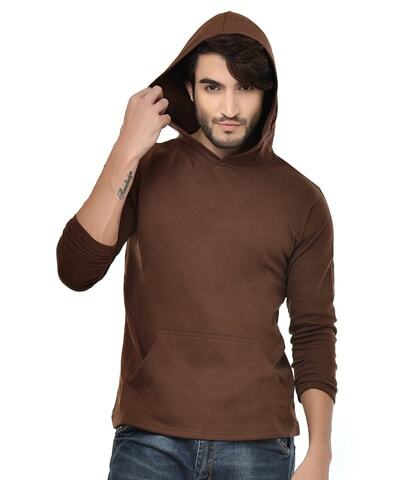 Whether you prefer hooded t-shirts for men that are easygoing wear for all the seasons as during summer, winter, autumn etc. 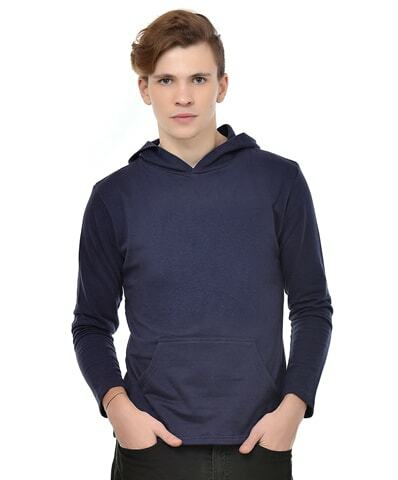 On an cold winter, evening wears a naval force Hooded t-shirts with some casual jeans and cozy fit. 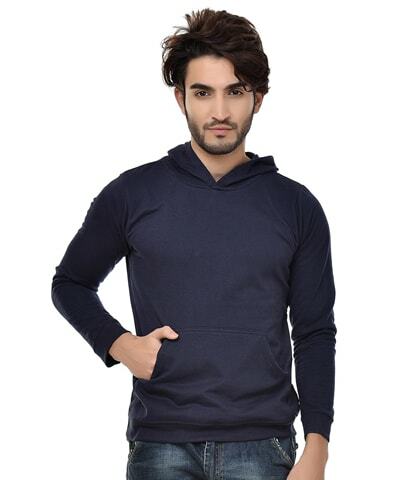 Take a look at our Neevov collection for Hooded t-shirts online India which are here available especially for men. All the people will be attractive towards your look what an awesome outfit. For your long drive or visit choose a dress in a brilliant red Hooded t-shirt with a couple of dark pants. Emerge from the crowd in your happy outfit and look fresh mode. Relax around at home with your closest companion playing computer games. Look cool in some board shorts and a long sleeves Hooded t-shirt. V Neck T Shirts and kids plain t shirts are well clothing during summer season. 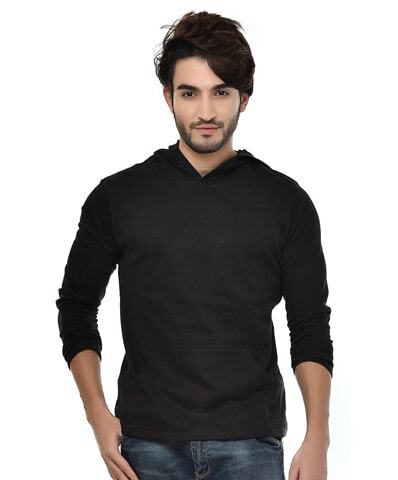 Men's Hooded Full Sleeve T-Shirt, solid black colour, softest, smoothest, good looking regular fit Hooded T-shirt for casual wear following as: 100% ring-spun combed cotton, Interlock, Fabric weight - 190-210 gsm, Pre-Shrunk & Bio Washed Fabric, Regular & Comfort Fit, Side Stitched For Perfect Fitting, Double needle hemming on bottom & sleeve.